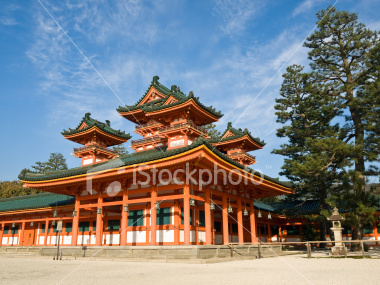 The Heian Jingu Shrine (平安神宮, Heian jingū) built in 1895, is a very famous Shinto shrine in Kyoto, Japan and a popular tourist destination. It was built to celebrate the 1100th anniversary of the establishment of Heian-kyo, which is the old name of Kyoto. Outside the shrine is the huge orange torii gate, the largest in Japan, which spans over the road. The Heian Jingu hosts the Jidai Matsuri, one of the three most important festivals of Kyoto. The procession of this festival begins at the old Imperial Palace, and involves carrying mikoshi (portable shrines) of Emperors Kammu and Komei to Heian Jingu. 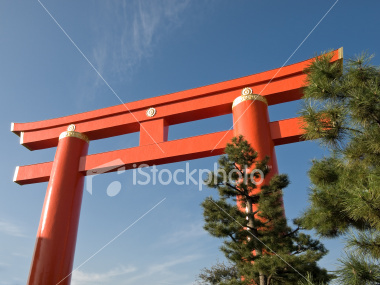 Huge orange torii gate, the largest in Japan spans over the street before the Heian Jingu Shrine in Kyoto. Built in 1929, it is just over 24 metres high and 34 metres wide at the top. 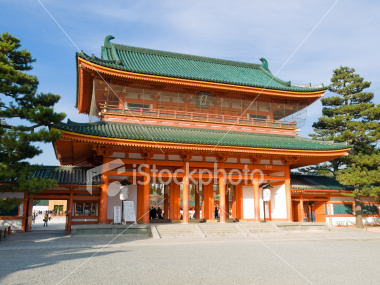 Main gate of Heian Jingu Shrine. 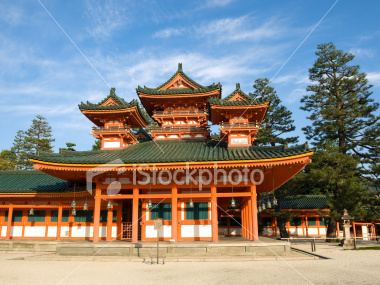 Part of the Heian Jingu Shrine buildings. 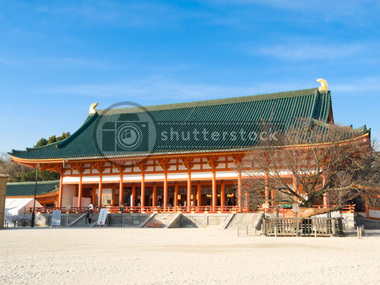 Main building of Heian Jingu Shrine. Another angle of part of the shrine.